Dojo (Gym): Sensei Hakim established JKA Pierrefonds in 1994. In 2009 he decided to change the name of the dojo and renamed it Makoto JKA. The dojo is presently located in the west island of Montreal, in Pierrefonds. 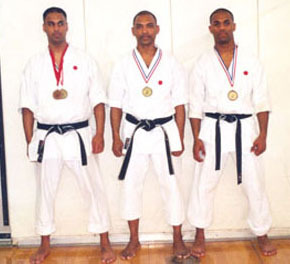 Sensei (Instructor): Hakim Ishmael started doing various styles of karate in Guyana S.A. at the age of 16. He moved to Canada in 1982 and started researching dojo's in Montreal. He was very lucky to have come across the Japan Karate Association (JKA). Sensei Hakim had to reform his past karate styles to allow him to transition into the high standards of the JKA. He has participated in numerous JKA competitions and has grown to his present status of 3rd Dan Black belt through his hard work and diligence towards JKA Shotokan Karate. Assistant Instructors: Terrence and Trevor Ishmael, Sensei Hakim's two sons, have both been assistant instructors at the dojo for approximately 5 years and have helped to grow the dojo to its present status. They have been practising Shotokan Karate diligently for approximately 20 years. They have also participated in many competitions, where they have had to compete against each other during the finals. The father & sons team have participated and succeeded in numerous team katas (synchronized techniques) and continue to develop their techniques.